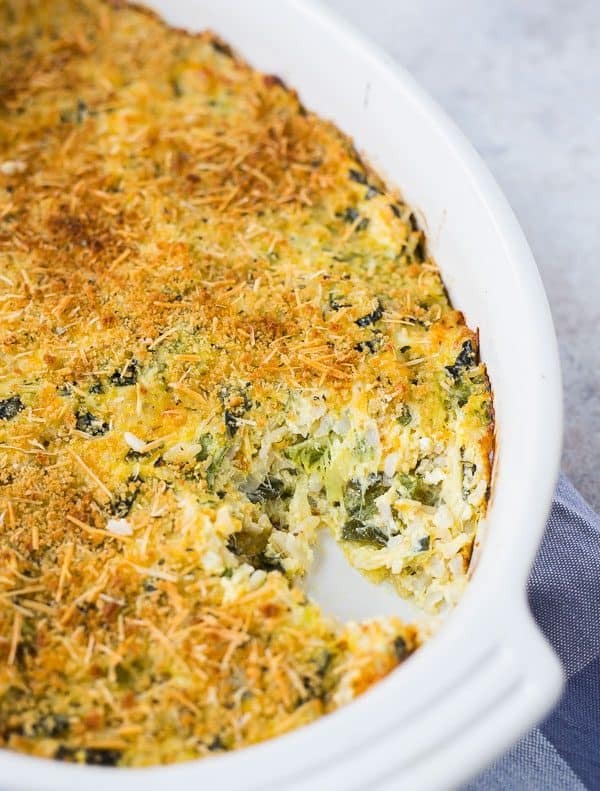 Cheesy, comforting, and filling, this zucchini rice casserole is going to become a favorite around any family table. It’s also a great use for leftover rice! You know I love my salads as much as the next girl but sometimes you want something more cozy and comforting. Something warm and soft, like a blanket, to wrap around you when you’re having one of those days. Okay okay okay I know we shouldn’t use food to comfort us, but there’s something about the magical combination of cheese and rice that does the trick. 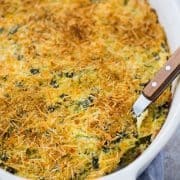 The best part of this zucchini rice casserole, though, is that you’re still eating something nutritious. You’re not drowning those sorrows in an entire chocolate cake or even a burger and fries. 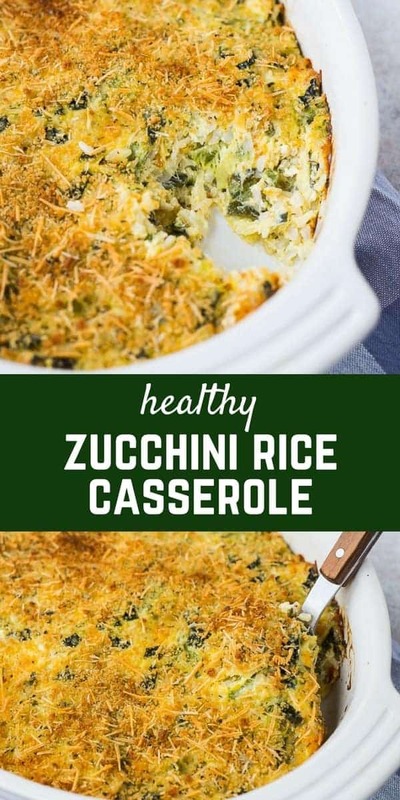 Included in this zucchini rice casserole are the obvious ingredients: zucchini and rice. Summer always leads to plentiful zucchini and this is a great use for it. 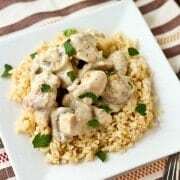 I used brown rice not only for its nutritional value but also because it’s filling, nutty, and flavorful. Then we get to the really good stuff — cheese! 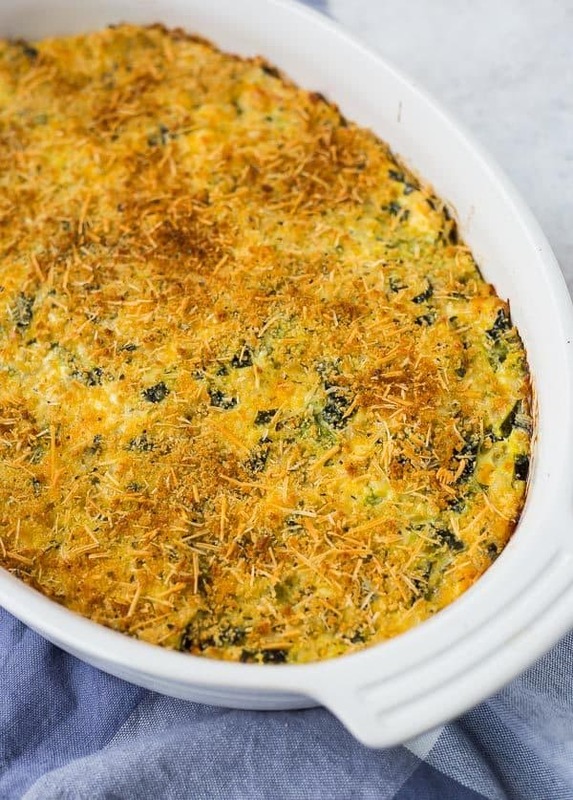 I used a mix of Parmesan and sharp cheddar to give this casserole tons of great flavor. It’s all held together with Greek yogurt, sour cream, and eggs. 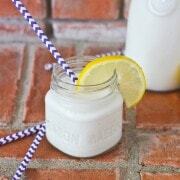 On that note, it’s a perfect way to celebrate June Dairy month! Make sure to follow along with longtime Rachel Cooks’ partner Milk Means More for more information about June Dairy Month, starting with World Milk Day on June 1st! A mix of whole wheat Panko bread crumbs (these are the kind I buy) with some herbs, spices, and more Parmesan gives this a crispy crust that seals the deal and makes this recipe a total winner. Preheat oven to 350°F. Spray a 9×13-inch pan with nonstick cooking spray. In a large pot, combine zucchini, onion, and chicken broth. Cover and bring to a boil over medium-high heat and cook covered for 20 minutes or until tender. Drain liquid and partially mash with a potato masher or fork. 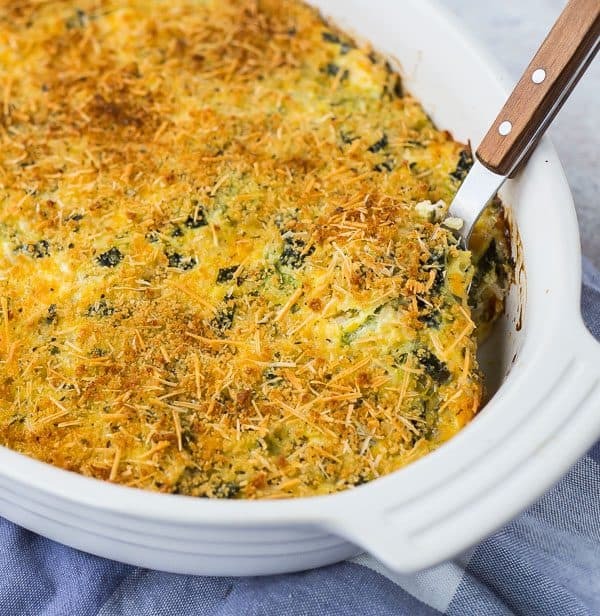 Combine zucchini mixture, rice, sour cream, Greek yogurt, Cheddar cheese, 2 tablespoons Parmesan cheese, black pepper and eggs until ingredients are mixed together well. Spread mixture into prepared pan. In a small bowl, combine breadcrumbs, Italian seasoning, and remaining Parmesan cheese. Sprinkle over zucchini mixture. Bake for 30 minutes or until golden brown and heated through. If desired, broil briefly (watch closely!) to brown the top. Note: This is best served immediately, but may be stored covered in refrigerator and reheated at a low temperature in the oven (put cold pan in cold oven and heat to 300°F or until hot, 30-40 minutes. Verdict: Cozy and comforting, this is going to become a go-to side dish or vegetarian meal. It’s hearty, cheesy, and creamy without being overly heavy. Husband’s take: Ben loved this! I also brought it to a family gathering and it was a hit with everyone there. Changes I would make: None at all are necessary! 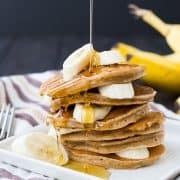 You could of course make these with white rice if you’d like. I’ve been really into brown rice lately! It’s so good! This looks amazing. :) Summer food is the best food! !